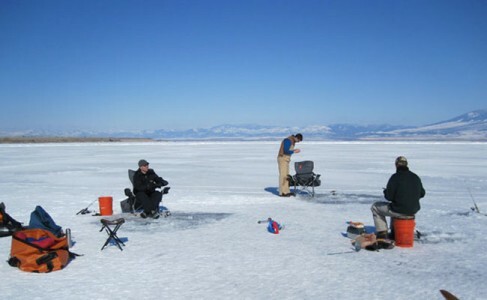 Hi, it’s Angie from Bob Ward & Sons in HELENA…c’mon out on the lakes, the ice is FINE! By which I mean thick, of course…there’s a little wind, but not enough to keep you from fishing. At CANYON FERRY, Sharon at the Silos KOA reports 8 – 9″ of ice up to Hole In the Wall at least, and LOTS of anglers out in their shanties…reports are also streaming in of folks fishing the CAUSEWAY on the HAUSER LAKE side, where the ice is deemed thick enough to be safe, in the 6-7″ range…just now hearing of some folks on the LAKE HELENA side saying the ice is about 7″, so that’s all good! Trout are being caught more often than Perch, & the best catches seem to be at about 20′ down….the Chartreuse hooks are working well, crawlers or maggots are being used, but don’t discount RATT jigs in the pink or lime colors! Most guys say that the earlier you get on the ice, the better, with the prime hours being from 6-7 am thru 10 or 11 am, so get up & get on the road for best results! The MISSOURI RIVER is still going strong, being the great winter fishery it always is! Fish are eager for some Streamer action, so drag out your size 2-4, nasty-looking bugs and strip ’em in the pools…try White Flash Fry or Zonkers, Whitefish Patterns or go a bit smaller with Minnows or Copper Zonkers in a size 6…you can also Nymph your Scuds, Beadhead Midge Pupas or PMD Emergers, Soft Hackles & Worm Patterns…these are all going strong, and are excellent go-tos this time of year on the MO. GREAT DIVIDE & SHOWDOWN ski areas both have packed powder, with nearly 30″ at the summits & some 27-28″ at the base, & are fully operational with all trails & lifts open, so you can fish one day and ski the next! Isn’t winter snow in MT just the best thing ever? Drop by the store & warm up, shop our magnificent after Christmas specials, and let us know how you’ve done on the lakes, or out & about on the MO! Happy New Year to all our listeners from the Bob Wards family…stay safe & FISH WELL! Talk to you in the new year!